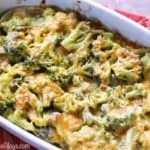 Deliciously cheesy broccoli casserole will convince even the most reluctant picky eaters that broccoli is in fact worth eating. Me? I adore broccoli. I enjoy roasted broccoli, steamed broccoli, and I especially love creamy roasted broccoli stalks. Alas, not everyone in my household agrees that broccoli is yummy, which is why I created this healthy keto broccoli casserole. It’s a very reliable way to serve broccoli to picky children, but it’s also loved by adults. 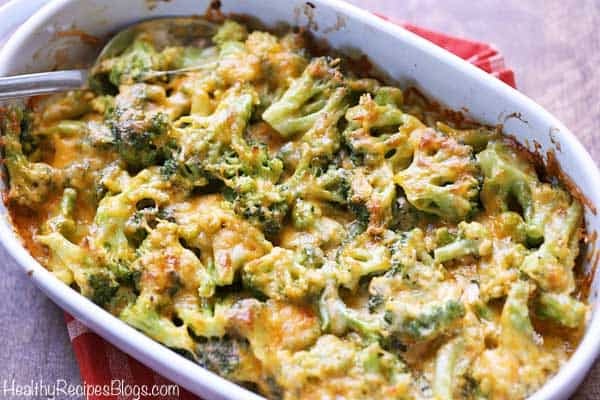 I especially like how easy this broccoli casserole is to make – it’s ready in just 30 minutes! Making it is SO EASY. You do want to lightly pre-cook the broccoli before placing it in the casserole dish. You can do this in the microwave. Next, mix it with the sauce, sprinkle with cheese and bake for a few minutes until hot and bubbly. You can also broil the casserole, which is my preferred method. It gets the cheese browned fast, without overcooking the broccoli. You can use fresh or frozen broccoli in this broccoli casserole. So it’s one of those side dishes that you can always whip up, even if you’re out of fresh produce. Having said that, this dish does taste significantly better if you use fresh broccoli. So whenever possible, that’s what I use. Is this broccoli casserole healthy? I think it’s very healthy! Broccoli is, of course, a very healthy vegetable. In the sauce, I use avocado oil mayonnaise, which is healthier than mayonnaise made with vegetable oils. If you wish, you can replace half the mayonnaise, or all of it, with sour cream. It’s true that this is a high-fat dish, but surely you know by now that for most healthy people, dietary fat (except for trans fats) is pretty much harmless. And dairy is even beneficial. You can keep leftover broccoli casserole in the fridge for about 3 days. Reheat it in a 250°F oven, or in the microwave on 50% power. I never tried freezing this casserole, but I think that should work too. A nice variation is to make broccoli pizza casserole. Make it the same way, but use 1 cup of no-sugar pizza sauce (such as Rao’s) instead of the creamy sauce (there’s no need to add water), and 1 cup of shredded mozzarella instead of the cheddar. A serving of this version is 1/4 casserole, and it has 145 calories, 8g fat, 321mg sodium, 9g carbs, 4g fiber, 3g sugar, and 11g protein. Place the broccoli florets in a large microwave-safe bowl. Add 2 tablespoons water. Cover and microwave on high until tender-crisp, about 3 minutes. Meanwhile, in another large bowl, prepare the creamy sauce. Mix together the mayonnaise (or sour cream), Dijon mustard, kosher salt, black pepper, garlic powder, cayenne pepper and half of the grated cheddar cheese. Add a little water to thin out the mixture, about 1 tablespoon. Drain the broccoli well and add to the creamy sauce. Gently toss to coat. Transfer the coated broccoli to the prepared baking dish. Lightly spray the top with olive oil. Evenly sprinkle the remaining cheddar on top. 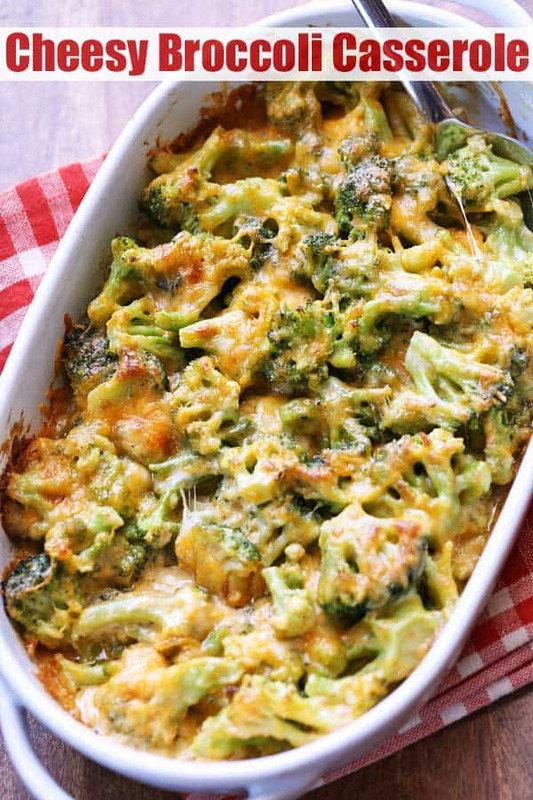 Bake the broccoli casserole until golden brown and bubbly around the edges, 15-20 minutes. If your baking dish is broiler safe, you can simply broil the broccoli casserole in the middle of the oven until browned, 2-3 minutes. This is actually a better method because it ensures the broccoli doesn't become overcooked.